I am getting a more serious start on my Holiday cards and wanted to make a special one for a special aunt. I was inspired by a card by Pam Sim (pam-simcrafts.blogspot.com) and wanted to make a similar card. With the exception of the lacy border die by Spellbinders, this card uses only Frantic Stamper dies, starting with the Horizontal Birch Panel. I tucked the kraft doe and buck into the woods, and then affixed the panel and the deer to a white glitter background (which appears a little pink because of the way the early morning light was reflecting). 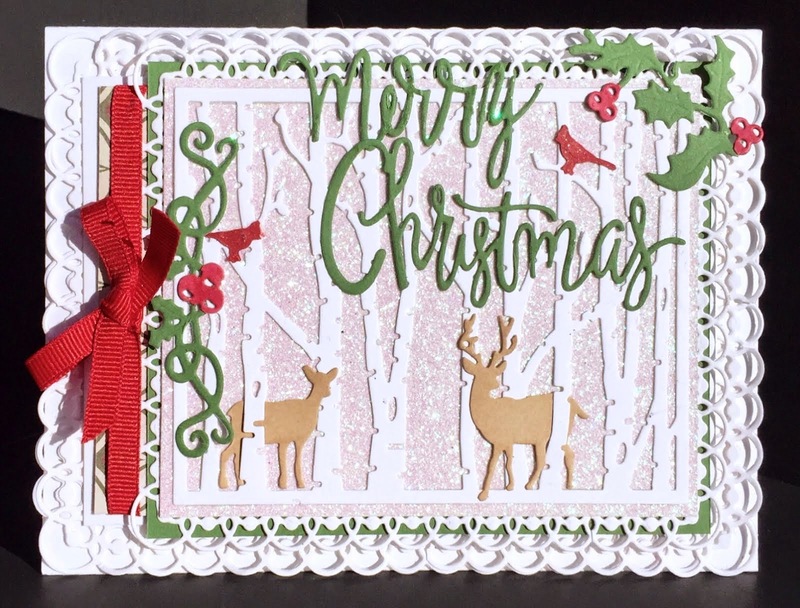 That glittery panel was mounted to a lacy border, and then to a green panel, a bit of Christmas print with a gross-grain bow tied around it, another lacy border, and finally the card itself, which was made out of 120 lb. card-stock. I finished the card off with a green script Merry Christmas and some green sprigs of holly with red berries and a couple of small cardinals. I hope you have enjoyed my card. I had a wonderful time making it, creating a simple wintery scene for Christmas. *** Materials for this project available at www.franticstamper.com. The Frantic Stamper Design Team is thrilled to have Amy Kolling joining us as a guest designer for 3 months, starting November 1st. We love her work and hope you will like it as much as we do! Here is a little about Amy, in her own words. Hello! My name is Amy Kolling. I'm so excited to be joining the Frantic Stamper Design Team for the next few months as a guest! 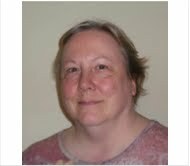 Just a little about myself.......I am married (for 18 years now! ), have 2 kiddos, and am a full time dialysis RN. I got started stamping way back when I was silly enough to "ask" to see a Stampin' Up catalogue. Oh did I only know where that decision would take me over the years! I became a demonstrator for a home based stamp company and while I enjoyed teaching at my workshops, I enjoyed the blogging side of crafting more. I slowly began my online presence by entering challenges and buying stamps from my favorite companies. 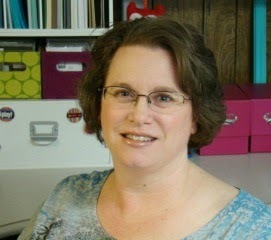 Now, I am enjoying being on several Design Teams and making friends all over the world through my crafting. Some of my favorite things about cardmaking: LOVE my dies (just ask my friends), CAS cards with a little "extra", and best of all, getting to meet lots of my online crafty friends! You can join me over on my blog: Stamp-N-Paradise. 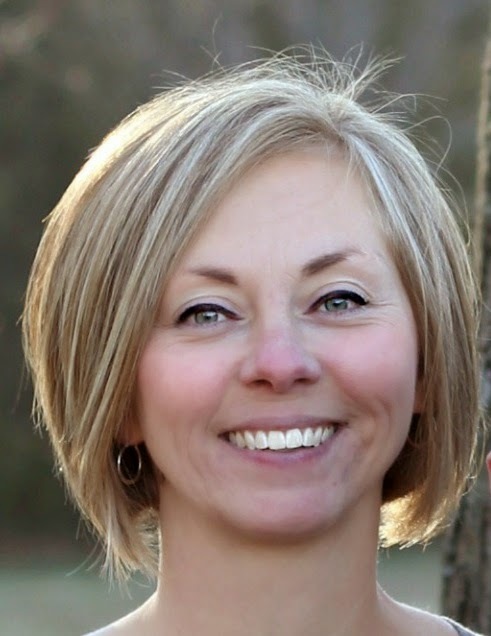 We hope you will make Amy welcome! My brother asked me to make some seasonal thank you cards that he could use to hand out to staff at the hospital he works at. I wanted to make some masculine looking ones as well as the typical ones I make with flowers on them. When I got the Large Thanks Frantic Stamper die (FRA-Die-09196) I knew it would look great on a card all by itself. It seems like diagonals are very popular on cards these days, so I cut the Thanks die out of a rectangular piece of orange cardstock, making sure it was centered all around. I then adhered that orange rectangle to a brown diagonal strip that fit the card and let the brown show through where the die had been cut out. I had plans to use the orange Thanks that had been cut out on another card. After I adhered the diagonal to the card front, I then used a ruler and the thin end of a Brushed Corduroy Distress Marker to add a faux stitched look. *** Materials for this project are available at www.franticstamper.com. I have several young nieces and nephews and wanted to make a Halloween card for them that wasn't too over-the-board scary. Using an inked blue and purple background with the gray hopefully gives the card a less scary feeling. I used the Frantic Stamper Precision Die called Bats & Ghost (FRA-Die-09232) and the word BOO is from the Frantic Stamper Precision Die set called Scary Words, Set of 4 (FRA-Die-09234). The ghosts are raised up slightly off the card using some foam dots. First, the DT news... I am sad to tell you that Rozy will be on hiatus from the team for an unknown period of time due to family health issues. We are sorry that she won't be with us, and wish her and her family all the best. 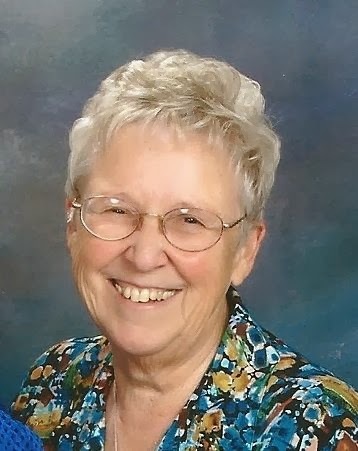 We hope she will be able to rejoin us sometime soon. We all like quick and simple so here is a cute little card using the Beehive Card Panel. Die cut several colors of foil using the Beehive Card Panel. Using an A2 card run it through your Xyron machine placing adhesive face side up. Lay the centered panel over the top. Use the inserts from other colors to form the flowers, after these are all placed sprinkle the card with micro fine clear glitter and brush off. Layer the A2 card on top of a black A7 card base. Make a tag that saying "Home Sweet Home" and place on the card . Using bee embellishments decorate as desired. Use Kaiser Craft Sparklets for the flower centers. Tie brown and yellow jute across the top of the card and tie in a bow. Be sure to try this die, you won't be sorry. It is very versatile and easy to work with. Kathy is doing a fantastic job designing these dies. We are all having a blast with them! 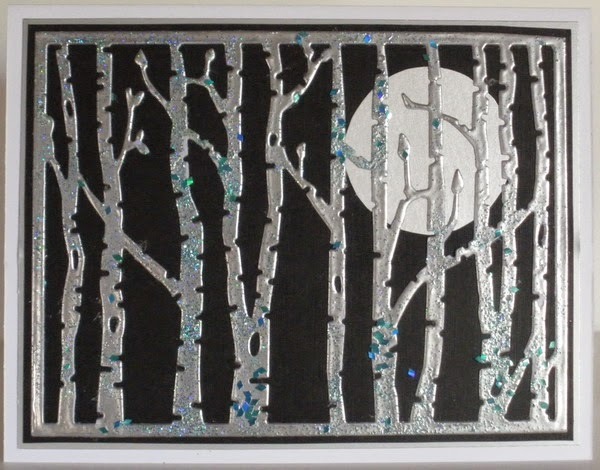 After I added glue to the back of my trees, I placed a moon cut from white shimmer paper behind the trees. 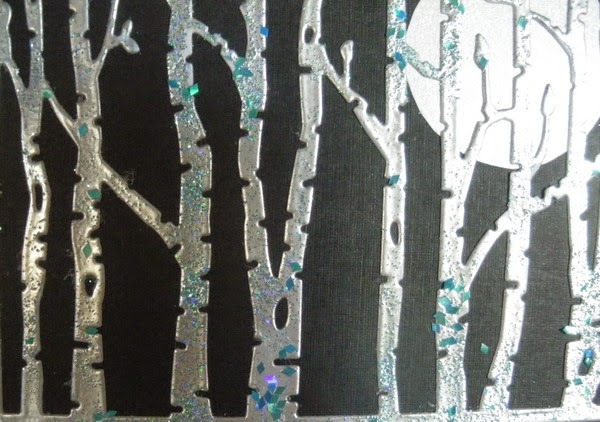 I glued my trees to a black mat and again to a silver glossy mat to finish my card. This die will also be perfect for Christmas; add snow at the base or on some of the branches. There are so many ways to use this birches die. I hope you will give the die a try! Hey everyone! I hope you had a nice weekend! As you know Fall is almost here and with Fall comes some traditional Fall foods, activities and decorations. One of the things I've been seeing plenty of lately is candy corn. I'm not a huge fan of candy corn but my family is! The card I am sharing today started as an idea I had when I was playing with a die from Frantic Stamper. I was using the Diagonal Stripe 3x4 Photo Card die for a fun project (that I'll share soon) and all of a sudden it reminded me of candy corn. The stripes and the balance of the die is perfect for mimicking this popular fall food! So after playing with it some more, this is the that card came from that idea. I started by using the Diagonal Striped die to cut some thin chipboard. I used a piece that wouldn't cut all the way through with the sandwich I created and this created a nice base that I could paper piece the rest of the pieces on top of and it also provided a nice guide for placement. I next used the die to cut a piece of yellow (and later added yellow glitter cardstock), orange & white cardstocks. I cut each piece apart in sections and then adhered them to my chipboard base. This created a nice candy corn look for the card. I added a vellum banner for the sentiment and gave it a little dimension by not adhering the left side down but letting it sort of "bubble" up. I also added some twine and a few pieces of white cardstock stripes to finish the card off and give it some visual interest while still keeping it simple. Thank you so much for stopping by today! I hope you enjoyed today's card! I'm curious...do YOU like candy corn?